This is a lap sized quilt 54x54. --Your stack has now been in cut into two parts. --sew your halves together to make a square again. --Press your seams as desired. 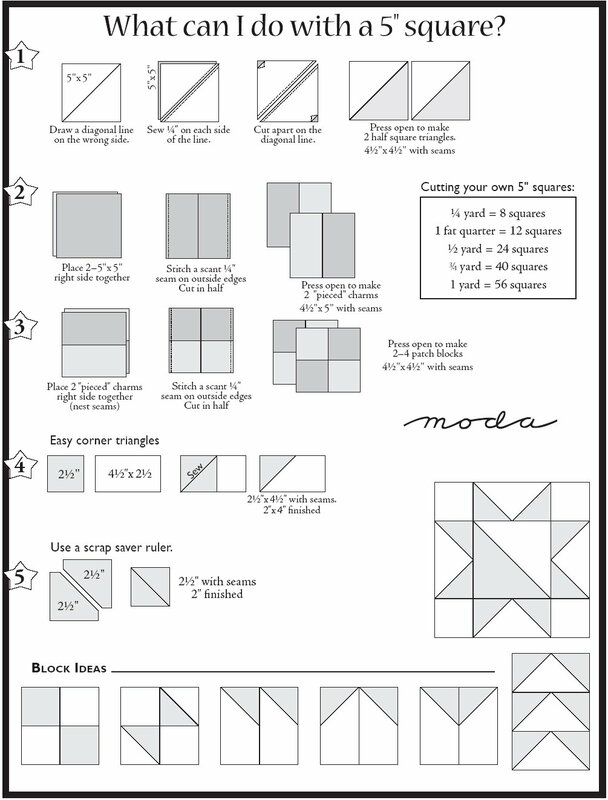 --Trim your squares to 8x8. 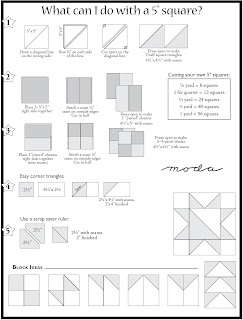 --Repeat this process until you have 25 slashed and pieced squares. -- quilt and bind as desired. ***changing the size of this quilt is easy. You will need to figure out how many squares you want. You can get 2 squares out of 1 fat quarter. You will also need to adjust yardage for the borders. I did a baby quilt that was 2 blocks by 3 blocks. I did 4 fat quarters so my patterns would be more random. Oh, my goodness, something else you are going to want to follow! Starting tomorrow Feb. 1 (my anniversary to Mr. Wonderful) I know I have been posting alot for you to follow but this is such a good one. Moda's fantastic designers are going to tell a little about themselves so hop on over to their blogs and have fun! 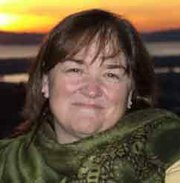 Beginning February 1, zip over to the UK to hear from Aneela Hoey. Feb 2. Visit the charming ladies from Blackbird Designs. Feb 3 Jan Patek is sure to entertain. 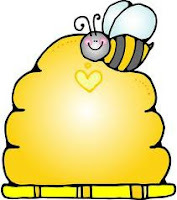 Feb 4th Hop on over to Anne Sutton and visit Bunny Hill Designs. 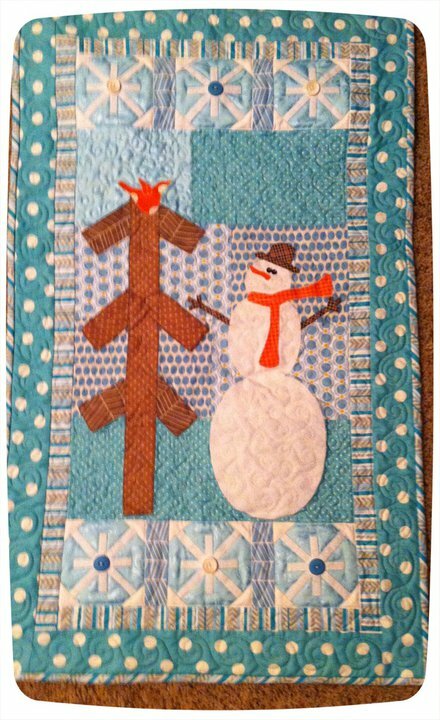 Feb. 5th Cotton Way will be featuring some of her wonderful projects. Feb 6th Joanna from Fig Tree has it all buttoned up. Feb 7th Kansas Troubles will amaze us all with her warmth and hospitality. Feb 8th Find out what Kate Spain has to share. Any pillow talk secrets? Feb 9th Kathy Schmitz has something wonderful stitched for you. Feb 10th Camille Roskelley wants some pillow time (sleep) after having a new baby in the household. Feb 11th Me and My Sister will energize you with the creativity oozing out of every orifice of their body. Feb 12th Hear what these two retired librarians (Minick and Simpson) have to show and tell. 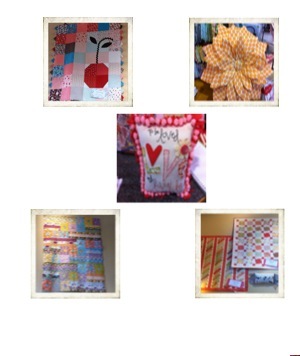 Feb 13th Liesl from Oliver+s has been so busy creating fun stuff. Feb 14th Sandy Gervais, the queen of hearts, is featured today. Feb 15th Lauren and Jessi Jung , one of our mother and daughter teams. Feb 16th Sweetwater is so-o-o-o inspiring. Feb 17th Visit this noted historian who probably can tell you when pillows were invented. Feb 18th Deb Strain has just joined the blog world. Stop by to see her creations. Feb 19th Join American Jane back here to talk about her design inspiration. Feb 20th Primitive Gatherings is joining in on the fun as our newest moda designer. Keep your calendar open just in case we have a few more people designers joining our pillow talk. 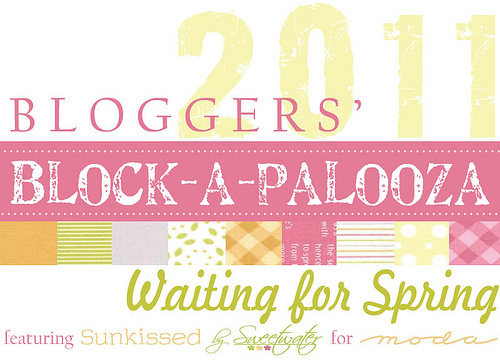 Well, I finished block one on the Block a Palooza, have I told you how much I love the Sunkissed line by Moda. Such yummie colors greys, yellows, pinks, and orange! I can't wait for them to post block 2. We are almost to our 1000 followers so if you aren't a followe please become one by clicking the box on the right side of the screen. We have all of the fabrics for Sunkissed if anyone wants to follow along. 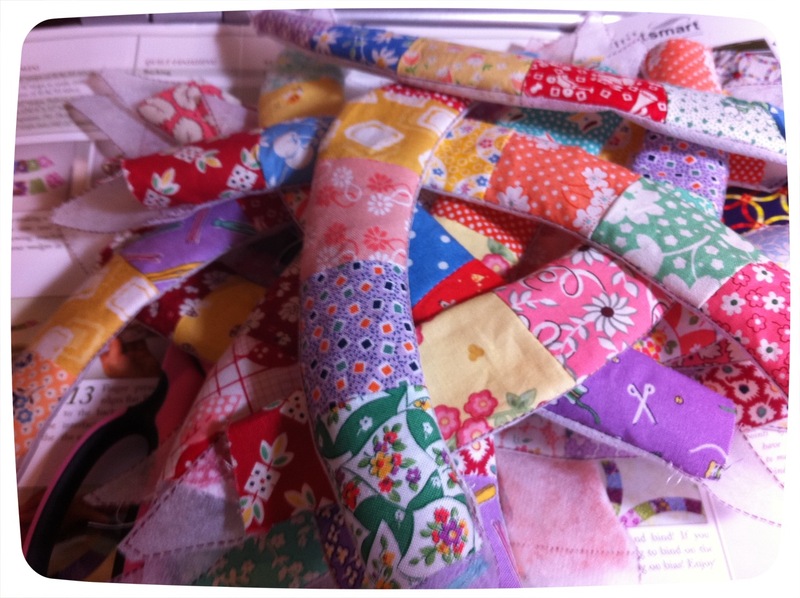 2 ½ inch strips of fabric…at least 15 inches long. Measure your diaper width wise. Sew strip onto one end about ½ inch from the edge using 1/8 inch seam. This leaves a little raw edge that will fray when washed. Measure your diaper length wise. Cut your strip in half the long way. You want two skinny long pieces. Sew one strip to each side of the thicker middle section using 1/8 inch seams. Jelly roll strips work great for this. No, you don't need glasses, for some reason I can't get these pictures clear. (or maybe they are clear and I need glasses?) This is just a touch of our Open House and there is more to come! I have been so excited for this to begin! 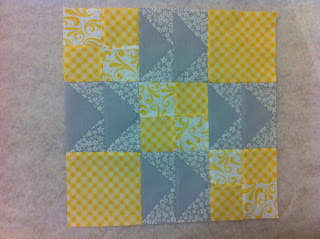 This is a quilt-along that will jump from blog to blog, featuring two original blocks per week. Today's first block begins with "Quilt Dad" He has the greatest blog! They are using the Sunkissed line which I absolutely love! Shelby is down at the shop busily cutting the kits for this is you want to follow along. You will just need to follow along with each blogger for their instructions of their block. If you finish your block or send me a picture we will post them all!! ﻿﻿﻿I had so planned on showing some pictures of some of the new quilts from Open House, but I didn't get a chance to take any pictures. Lameo, I know! ( I will post pictures tomorrow. pinky promise) We have some really great quilts up right now and of course I want to make them all! Right after we opened, my favorite BROWN truck pulled up and left us 10 boxes. Now, I know that sounds so exciting but during Open House it gets kind of crazy, and cramped in our classroom/storage room/counseling office you get the picture right? Well, the ones I got opened before I left for the day were Charlevoix from Moda, (which I love!) We always order the entire line so if you ﻿love this line hurry we couldn't unwrap it fast enough! I will post a list of all the newness soon! 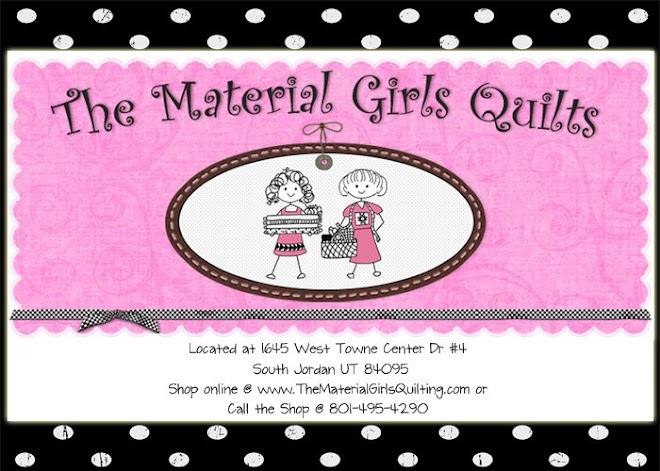 Tomorrow Friday January 21 & Saturday January 22 is "Winter Open House" at Material Girls Quilts. ﻿We will have our new class schedule out, all new quilts and things displayed, games, prizes and just a fantastic party planned! We have lots of new lines in, one of my favorites is "Sunkissed" by Sweetwater. It makes me want Spring. We have so many precuts of the new lines expected to arrive any day now. So, load up the car and come on down! Okay, I think I told you about my birthday present (from June) that Shelby thought of & Tom paid for. I wanted a Singer Featherweight sewing machine. 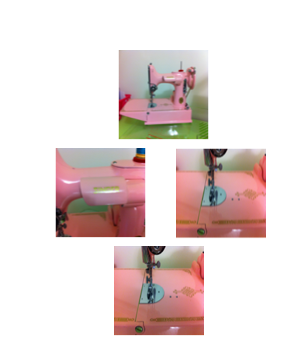 Not just any old machine I wanted it custom painted pink. So, off I went to search on the internet, and lo and behold I discovered Desk Dave's Featherweights I didn't own a featherweight so we purchased this from him and told him what color and Walah! about 6 weeks later this little beauty showed up!! Ain't she PURDY!!! I love her!! Her name is Petunia! I had never sewn on a featherweight before and now I am hooked. She makes the best stitches and keeps me happy! I am thinking she needs an aqua sister. hint, hint! The weather outside is frightful...OK so this week it isn't so frightful, but we can get another cold snap at any time and this is just cute to wear as an accessory. Gathering thread – thicker thread that wont break. Sew two pieces together on the short end. Repeat this for the other two. Find the center length wise and press. Press wrong sides together this way the gathering thread will sit down in the crease. Sew the two pieces right sides together with ¼ inch seams. Make sure your pull strings are at the same end. Leaving a 3 inch opening at the pull strings. Gather to desired length. Tie the two pull strings together to hold the gather. I put the scarf around my neck and push the gathers up. That way I get the length I want for sure. Edge stitch the hole closed. Fuss with your gathers to make it perfect for each wearing. ** If you want a longer scarf get 1 yard of fabric and cut 6 5 inch pieces. Sew 3 together instead of 2. The rest of the instructions will be the same. I apologize for the multiple fabrics used in the pictures. I had attention problems while writing this tutorial. It took me three scarves to get all the pictures I felt were needed. Have you heard about this? 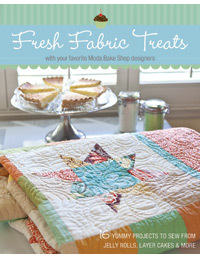 Moda and Stash books have joined together a few of the Moda' Chefs recipes to create this fun book. Starting January 19th through January 26 they are visiting 2 of the chefs per day. Find out which favorite cut is theirs and other tasty treats about them. 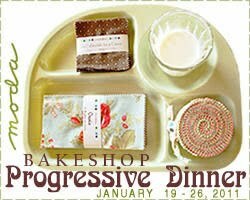 The first stop is Moda Bake Shop & Stash Books. This is going to be so much fun! Barbara Jones of "Quilt Soup" has done it again. We just received her newest line "Doll Babies" in the shop and it is really cute. Pink, Blacks, Orange and Lime make up this cute baby line that is sure to "Wow" you. If you have a new baby girl coming into your life this is a fun line. Diaper Bags, Crib Bedding, clothing, oh the possibilities are endless! Stop by and get yours today! I am so excited for this to start! Blogger Block a Palooza It looks like a lot of fun and we will be doing it along side all of you at the shop. We have Sunkissed by Moda in the shop, but we have lots of other lines in stock if that isn't your style. Hop on over to the blog and check out the details! Let me know if you need a fat eighth bundle. 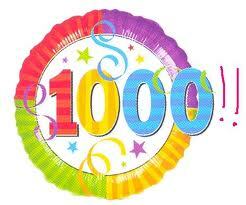 We want to make this a party girls!! So come join in on the fun! ------You can get the two smaller out of one charm. ---Wonder under three circles, one of each size, together. Make sure all three are different fabrics. If you want a ragged edge make sure your wonder under is smaller than your circles. ---Wonder under the circle trio on a 6 ½ background square. Repeat this for all squares. ---Appliqué on using your favorite stitch. I used a straight stitch ¼ inch in from the scalloped edge. This way when I wash the quilt it gets a frayed edge to each circle. Repeat this for all squares. ---Sew 5 complete squares together. Repeat this until you have 8 rows. ---Sew the 8 rows together. You will now have a completed center to your quilt. (The picture shows only 6 rows) The last two close ups are after 1 washing. 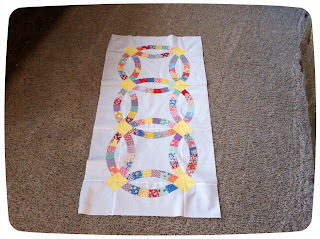 --Measure your quilt and piece together your outer border and sew onto the stop border. ---Your quilt top in now complete. 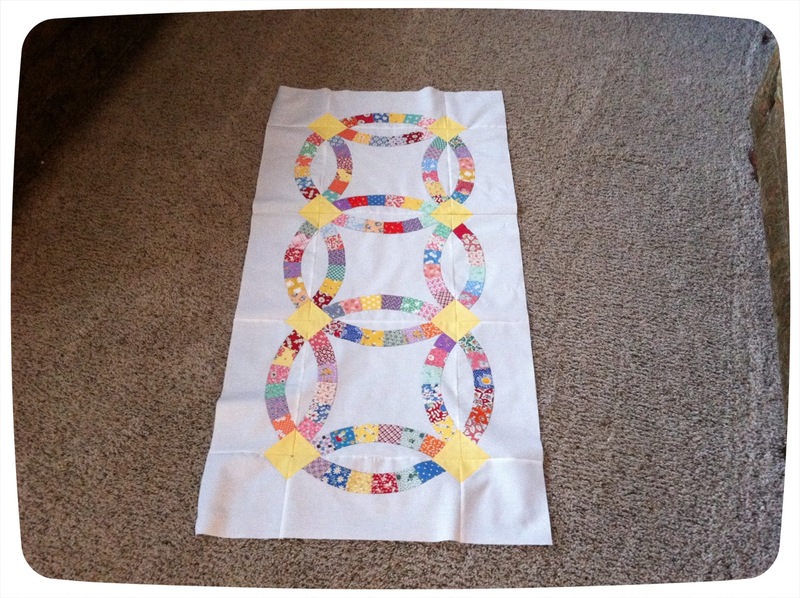 Cut your backing to appropriate size, quilt and bind. 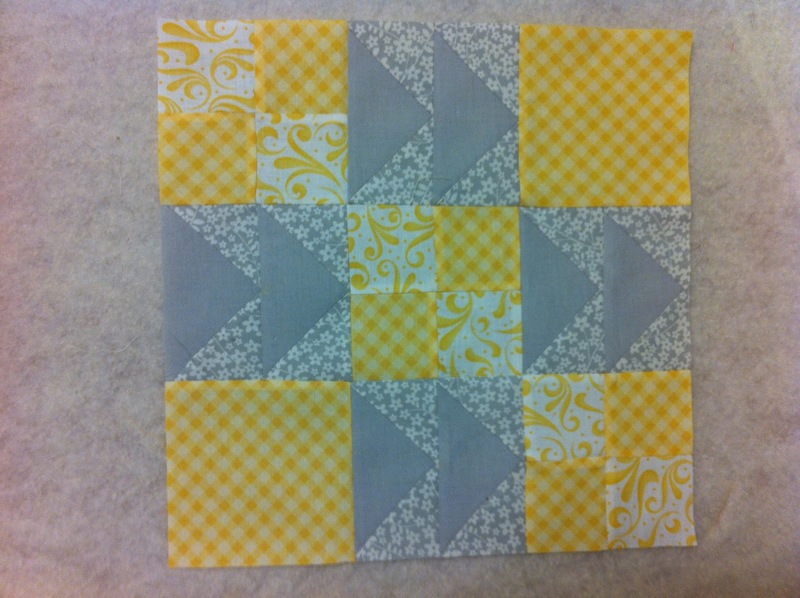 This quilt uses dies the for the Sizzix die cut machine. If you do not have one, you will want one. I promise. I use my circle dies almost everyday while working on projects. Both the machine and the dies are available to order through the store. With the sizzix you can cut mulitple layers at one time. I have never had the blades wear out on me (I have had my machine for years) The dies will be mentioned in several tutorials to follow as well. These are 2 of my latest projects, I figured I had better get them posted before the snow went away! We have kits available for both the wall hanging & the "SNOW " pennant. Just call the shop for details these go fast so be sure and call soom. I hope you love them! Nadine! 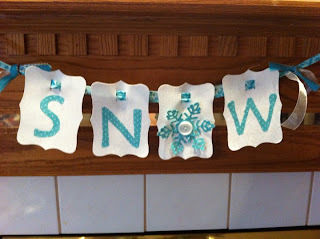 These are voth super cute projects you are going to want to make both of them! Call the shop and reserve your spot today! I get asked all the time what to do with the charm squares (5" inch square) so as I parade them around the shop showing them all the patterns, and then my daughter shows them this! Sheesh! Why didn't I think of that! So here it is! (You should be able to click on this and enlarge it) There are tons of great patterns for charms and all the other pre-cuts out there but this is a start and great if you are a beginner. 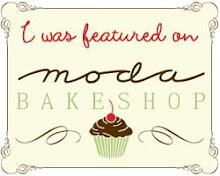 Be sure and visit Moda Bakeshop it has the best selection and ideas for all of the pre-cut. 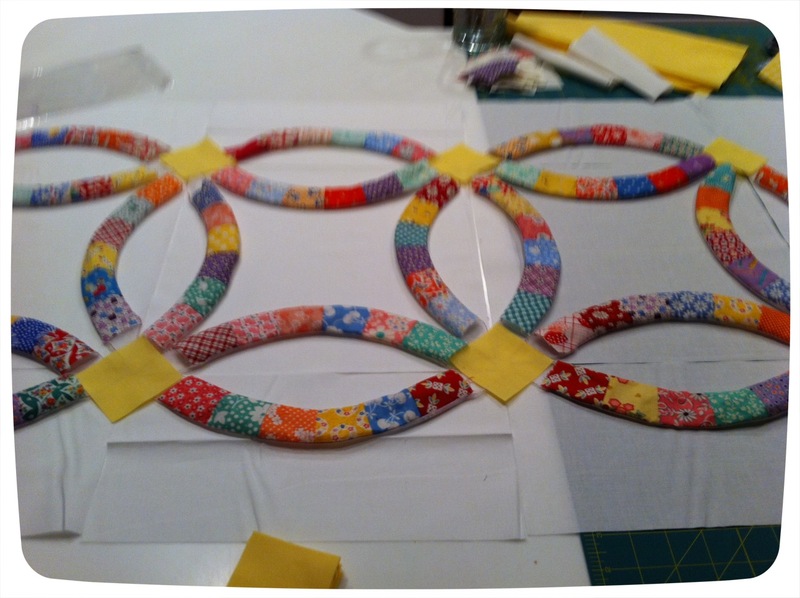 Okay, I really want a full quilt of the "Double Wedding Ring" but for now this will have to do. I made this tablerunner using the Quiltsmart panel. Loved it!! 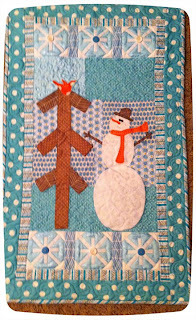 This will be one of our classes for our "Winter Open House" I used all of my old "Aunt Gracie prints" it was super fast, & super easy my kind of project. I can't wait to share this with you! If you haven't used the Quiltsmart product yet you are missing out. We have done several of thier bags & things and can't say enough good about them. 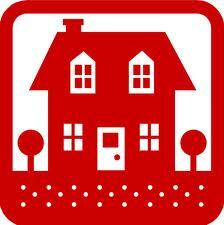 We will be offering several of there projects through out this year. Our class schedule will be coming out soon so watch for it. If you are interested in taking the class give us a call 801-495-4290 and reserve your spot. Mark your calendars for Thursday Jan 6. from 6-8pm Annie Smith from "Quilting Stash" podcasts and author of "the Ultimate Applique Guidebook" will be at the shop. Annie came to our shop when I first opened and has amazing applique patterns. We are so excited to welcome her for a trunk show and autographing of her first book!! Call the shop to reserve your spot 801-495-4290. If your new years resolution is to get into shape, maybe having a cute bag to tote to the gym will make it a little easier and more enjoyable. Cut a 40 inch by 14 inch piece on the fold from both the outer and lining fabrics. Cut 2 4 x 14 inch pieces from the outer fabric. These will be your casings for the drawstring. Cut interfacing to 36x14 and iron to the wrong side of the outer fabric. Center the interfacing. This allows for easier gathering. With the two casing piece fold the short ends in ½ inch and press. Fold the pieces in ½ the long ways and edge stitch to hold. Sew casing onto the right side of the outer bag matching the raw edges. Short ends of the casing should remain open. Sew the lining piece right sides together on the sides. Make sure to leave a 4 inch opening on one side to turn the bag through. the opening is between the two black marks. With Right sides together slide the outer bag into the lining. Matching up side seams. Make sure casing is tucked down in. Pull throw the opening in the lining and push out the corners. Push the lining down in and press. Make sure to press the casing up. Repeat with the other piece of cording but going the opposite direction. Your lose ends should end up on opposite sides of the bag. Edge stitch in order to close the hole and secure the cording. Pull the drawstring and you are done!!!! !